Rainfall has been at a premium in southern California and with July traditionally the driest month of the year, gardeners must take extra care to keep their gardens growing and landscapes looking their best. 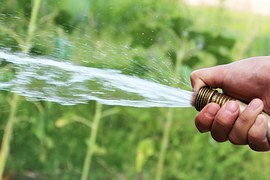 Deep Water Your Lawn: Some cities have lifted or plan to lift watering restrictions, but many cities still require residents and businesses to water only once or twice a week. A lawn can still stay green with limited watering. Water lawns deeply--for the maximum time allowed (usually 15 minutes) so water penetrates six to eight inches into the soil. Make sure sprinklers produce limited excess spray to avoid evaporation Aerate you lawn making it easier for water to soak in. Rethink Grass: Lawns are a landscape's biggest water guzzler. Many types of drought tolerant groundcover are available that can replace all or a portion of your lawn including lavender, ornamental grasses, sage, succulents, iris, geraniums and California fuchsia. Thoroughly remove the portion of lawn that will be replaced, till the soil and amend with compost before planting. Add More Mulch: Organic mulch is usually made from recycled trees and other wood materials and comes in various chip sizes. Mulch naturally decomposes over time. Add mulch around plants and trees and make sure the mulch is about three inches deep. If less than that or if bare spots are showing, add another layer. Mulch is of particular value during summer because it keeps plant roots cool even during the heat of the day. It also reduces moisture loss and suppresses weed growth. Encourage Vegetable Production: By now, the tomatoes, peppers and squash you planted in spring should be producing vegetables. Pick vegetables often, even if you don't plan to use them immediately. Vegetables that stay past its prime on a plant will produce a chemical that inhibits further blossoming. Check plants daily during the summer. Some vegetables, especially varieties of squash, seem to grow an inch or two overnight. Leave Garlic and Onion Bulbs Alone: If you planted garlic and onions in spring, you may notice their foliage beginning to turn brown. If you see healthy bulbs just beneath the surface, stop watering and let the plant dry naturally. To prepare the bulbs for harvest, bend the foliage around the bulbs so the bulbs develop dry outer layers that will enable them to be stored for long periods. Plant Vegetables for Fall Harvest: Because planting season is just about year-round in southern California, you still can grow a variety of vegetables in July and enjoy vegetables by late summer and early fall. These include beans, beets, carrots, corn, cantaloupe, okra squash and spinach. Keep Rose Bushes in Full Bloom: Rose bushes should be awash in color in July as buds form rapidly during warm weather. To stimulate more buds, remove dried flowers by cutting back to the first leaf after the flower cluster.